Hop To It and Get Ready for Easter! Hello stamping friend! Can you believe that we’re into the last week of March already? Time sure seems to be flying fast, which is why I thought I’d share my ‘Hop To It and Get Ready for Easter’ class this past Friday. With Easter coming up quickly, I didn’t want to wait until April to hold this class. I know how busy life can get, and how we quickly run out of time. So we got together and made 2 cards and decorated 2 of the new Mini Egg Cartons. These bright fresh colours say ‘Spring’, even if the weather doesn’t! 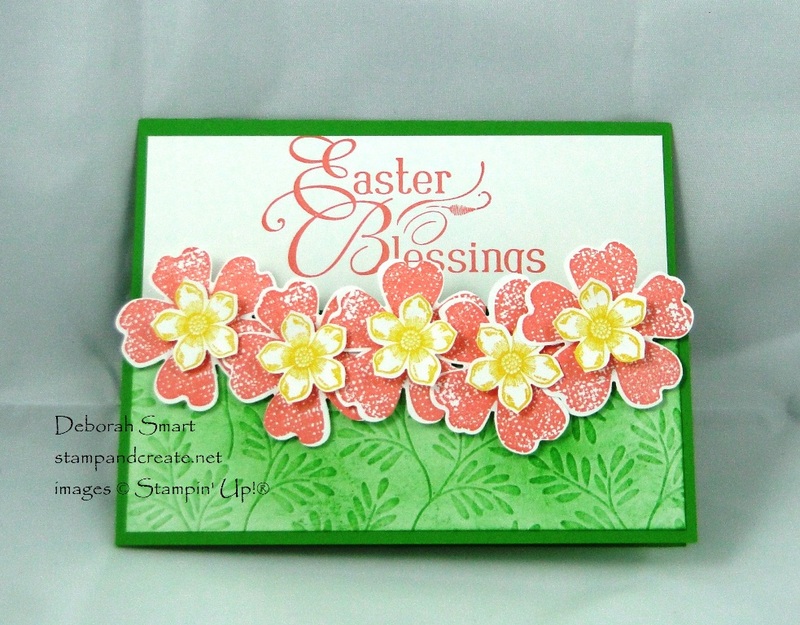 Using Emerald Envy, Sweet Sugarplum and Daffodil Delight ink colours keep this card bright and cheerful. 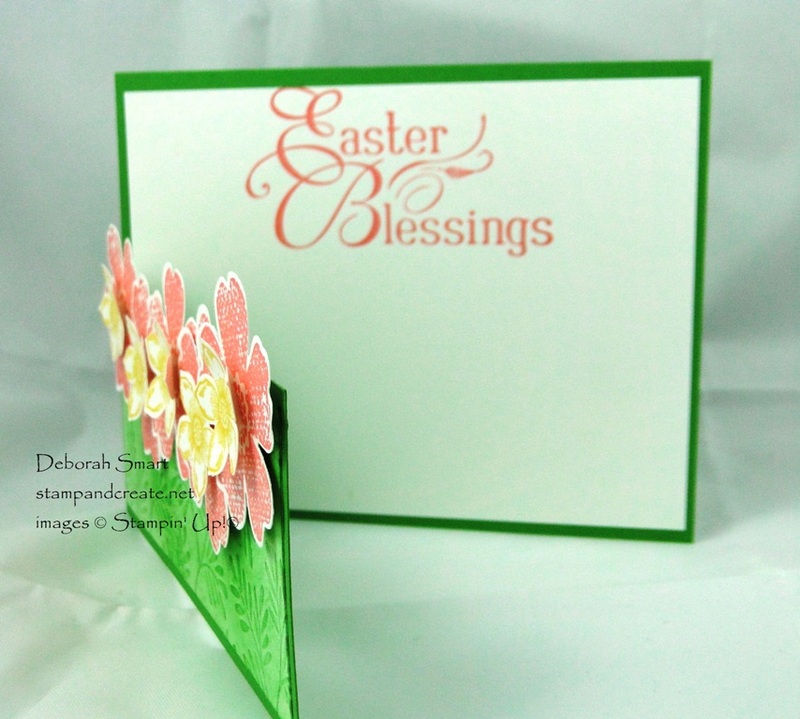 To create this fun fold, your Emerald Envy card base is the standard 4 1/2″ x 5 1/2″, scored and folded at 4 1/4″. Next you want to measure 2″ down from the top on the front flap, and cut off that portion. This gives you what I call a ‘dutch door’ look; the bottom half of the card closes, leaving the top open so you can see the sentiment. I used some retired embossed paper from the Holiday catalogue; I think it’s called Festive Frost. Use a Sponge to rub the Emerald Envy ink over the embossing. Next, stamp the flowers from the Flower Shop stamp set in Sweet Sugarplum and the small flowers from Petite Petals stamp set in Daffodil Yellow ink. No need for fussy cutting – use the coordinating Petite Petals and Pansy Punches to punch out the flowers, and layer them across the top of the bottom ‘flap’. Keep in mind that you’ll want to leave the sentiment visible, so alternate the height of the flowers as you’re layering them. Finally, stamp the sentiment on the inside panel of Whisper White, in Sweet Sugarplum ink. I used a retired stamp that I’ve had for years! 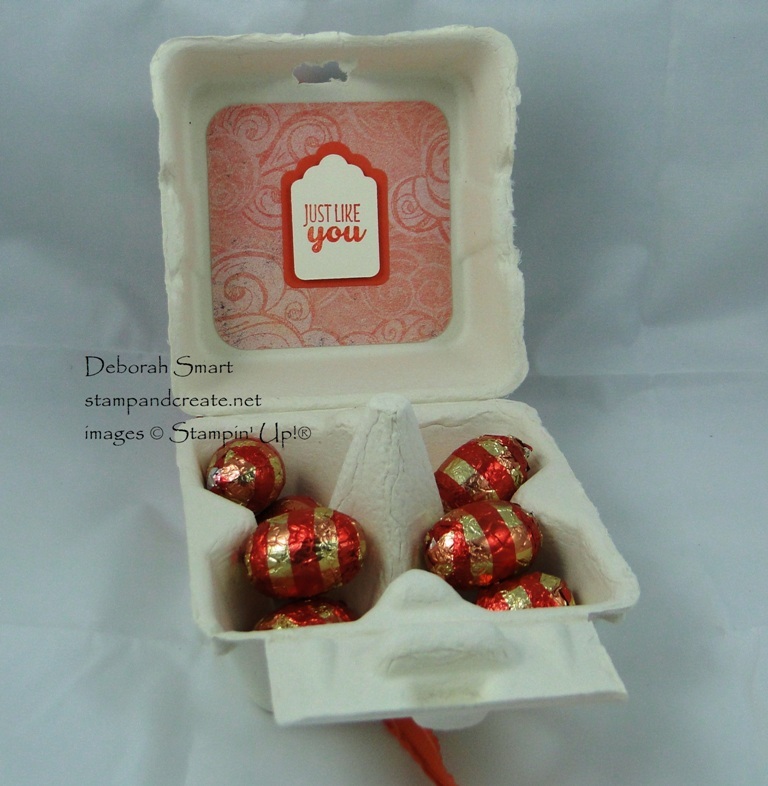 I am so glad that I ordered these Mini Egg Cartons over a month ago, as they’re not available right now! The good news is that the new shipment, which is being held up by Customs Clearing, should be arriving at the warehouse in a few days. And how about this punch art bunny – isn’t she adorable? To show off the soft natural vanilla colour, I left this egg carton uncoloured. There are lots of layers on the top; the first is a square of Cupcakes & Carousels DSP, with the corners rounded. On top of that is a rosette that I made with another pattern from the Cupcakes & Carousels DSP. Before attaching the DSP, I wrapped the retired Calypso Coral Ruched Ribbon around the carton, so that I could tie the bow in the front. I used a couple of now retired punches to create the bunny. The Flower Builder Punch (for the ears) and the Oval Punch (body) are retired, but you can substitute with the Layering Ovals Framelits and the Leaf Framelits for the ears. The 1 3/4″ Circle Punch was used for the bunny’s head. Each was punched from Soft Suede cardstock, and then the edges sponged with Soft Suede ink, using a Sponge Dauber. The Mini Glue Dots are great for putting the pieces together. For the tail, I used a retired flower embellishment; I think these were from at least 2 years ago. To get the Calypso Coral ink on the tail, I just pounced it directly into the ink pad. 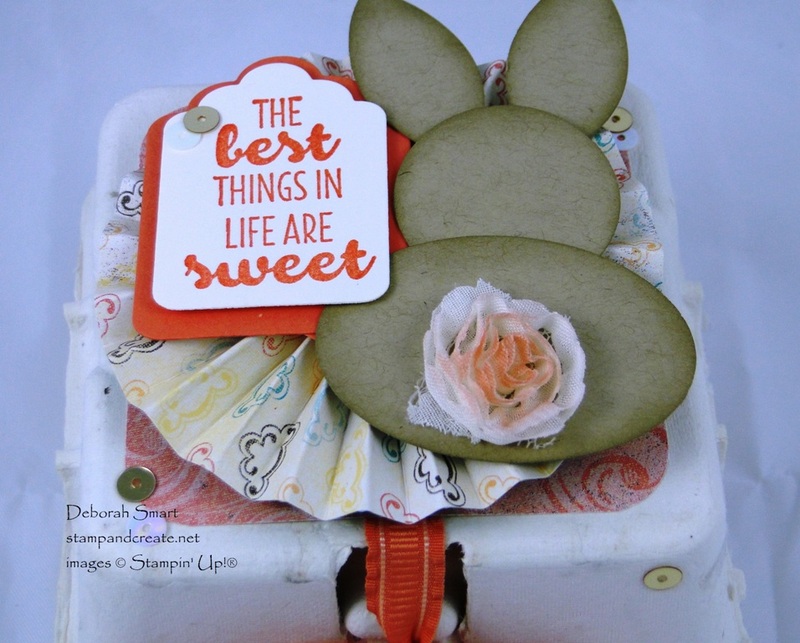 Next to the bunny is the sentiment stamped in Calypso Coral ink onto Whisper White, from the Suite Sayings stamp set. Both the sentiment and the layer below it were die cut with the Big Shot and the Tags & Labels Framelits. Of course, you can’t have a pretty outside with a plain inside! 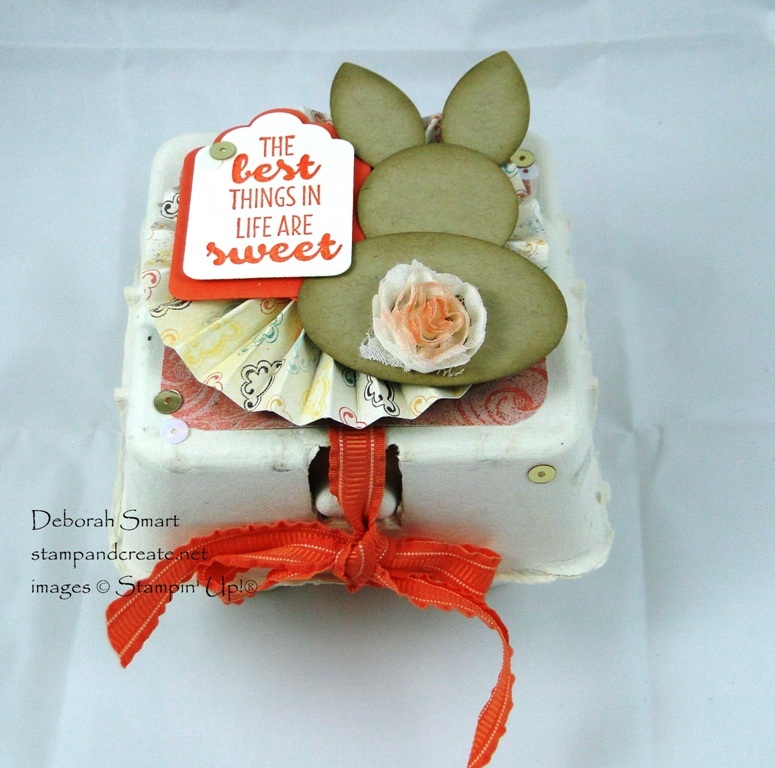 The same pattern is used to line the inside lid and the sentiment is finished on the inside of the egg carton! Keeping consistent with the top of the carton, the same Tags & Labels Framelits were used, as were the same colours. It was pure luck that the caramel filled chocolate eggs I bought earlier matched the colour scheme of the decorations! Be sure to click on the images below to order directly from my online store! Previous Previous post: A Great Offer Going Fast! These are great Easter projects, Deborah. I love the bright colors of your card and the bunny on your egg carton is adorable. I love your fun-fold, Deborah. And the bunny egg carton is so cute. Can’t wait until mine get here. Darling, lovely, wonderful. The card is so cute the way it swings open. LOVE that egg carton with that wonderful bunny.